The MLTI laptops are all equipped with a carefully selected set of applications. These tools are designed to allow students and teachers to explore a broad range of possibilities and options in terms of what they can research and create. To make it easier to parse the list of applications, we have divided them into seven broad categories. These seven categories are: Internet Tools, Office Tools, Math & Science Tools, Info Organization, Media Tools, Educational Games, and Utilities. The webinars offered by MLTI are grouped according to six lenses that have been selected to be applicable across subject areas, while at the same time retaining enough specificity to provide educators with useful focus. The six lenses are: Research Process, Writing Process, Making Meaning, Digital Storytelling, UDL/Accessibility, and Digital Citizenship. Blog posts on the MLTI website are also categorized according to these lenses, so that they can be readily contextualized within the same framework. 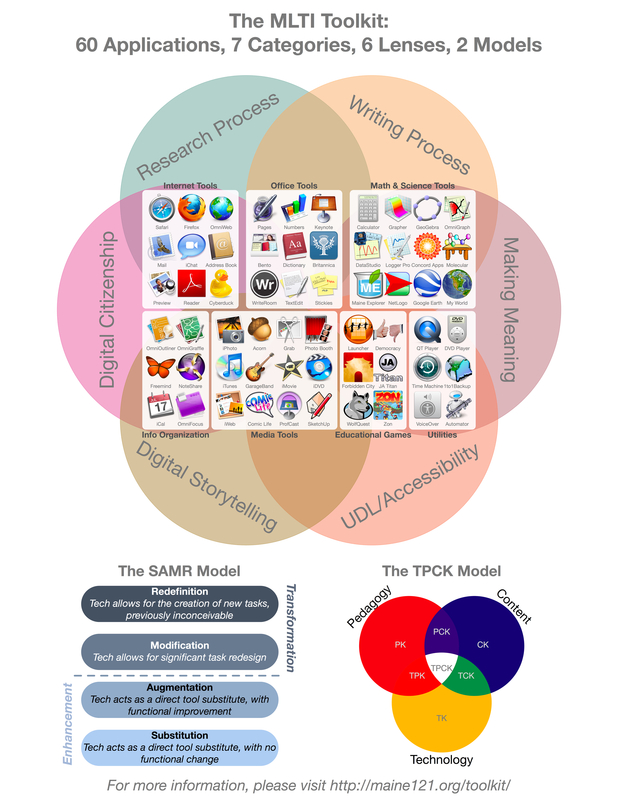 The SAMR model provides teachers with guidance on how to plan out the incorporation of technology into their classrooms, and what types of outcomes they can expect for different levels of technology use. The TPCK model outlines what teachers need to know in order to execute these plans efficiently and successfully. Taken together, the two models help teachers by showing them both how to incorporate the best of their past practice into the new domain, and how to accomplish significant changes in their classroom. This is a nice offering a poster sharing the Toolkit Possibilities!